Fairs and exhibitions always offer a potential to gain new customers that should be used – in the end, you can attract a few thousand people at such events. Reason enough to take advantage of the possibilities of merchandising and distribute promotional gifts at fairs and other events. allbranded can print your logo or claim on all promotional items, so that visitors will remember who the practical trade show giveaways are from when they are back home. Leave a long-lasting impression and create a lasting memory in the mind of your potential customers! 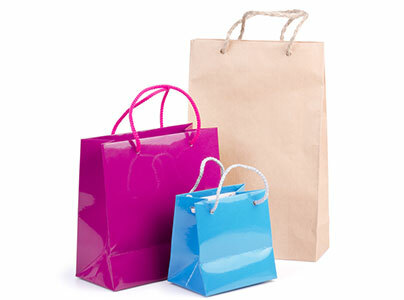 Take the printed paper bags with your logo as an inexpensive advertising medium at trade shows, conferences and other events, so that your stand’s visitors can transport the presents comfortably. At fairs, the customers are usually confronted with a wide range of companies that often belong to the same industry. This makes it increasingly difficult to differentiate from other competitors. With allbranded and our customised promotional giveaways, you can distinguish yourself from other firms at such events. No matter if you are interested in pens with the branding and logo of your company, or prefer technological products like USB sticks – you will find whatever you desire in our allbranded online shop. Not only trade shows and exhibitions are an ideal opportunity to leave a positive image with allbranded strewing products: Use the appropriate promotional products for seminars, workshops and conferences and win over potential future clients. Prepare printed pens or notepads with you company logo for conferences. That underlines the impression that you firms pay attention to all details and is prepared – and in many cases, such promotional products are taken home after the event. This leads to another benefit for the advertising company: Family and friends also get in touch with the products. In this way, the company automatically reaches a larger number of potential customers. If you use the potential of promotional items at exhibitions and other events, your company will benefit financially. 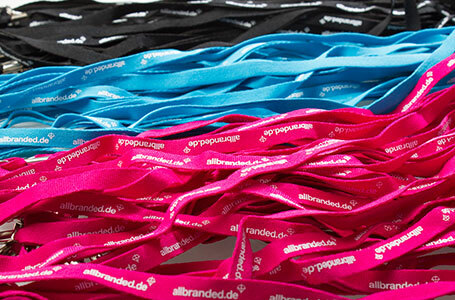 allbranded offers you the opportunity to print large numbers of pens, USB sticks or wristbands with your company logo. This results in cost digression effects, depending on the quantity. The resulting costs are usually only a fraction of the normal advertising budget. You reach a large number of customers by distributing individually customised promotional items at exhibitions and trade shows. The positive effect of promotional products is enhanced as the customer is automatically reminded of your company each time he uses the product. That means repeating contact with the customer for comparably lower prices. If you represent a company that specialises in kitchen and home appliances, you may not want to promote your products and image with branded USB sticks. In this case, printed cups may be better suited. In cooperation with allbranded, we will exactly determine which colour the coffee cup should have and which further design elements are helpful. If you attend a trade show like the CEBIT, promotional items like USB sticks or input pens for smartphones can be the right choice. When you choose the right promotional product, you should first analyse the goals of distributing gifts at the exhibition. 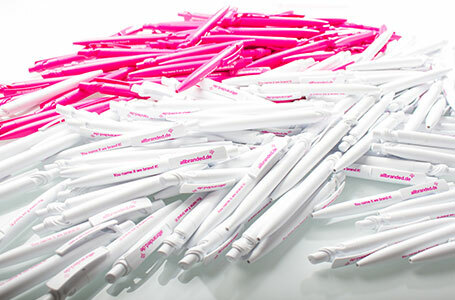 If you want to reach a broad audience, cheaper products like pens are well suited. In this case, the primary goal is to make your company and brand present in the mind of potential customers. If you want to target a selected group of customers, products of higher quality are appreciated, for instance small pocket knives. Customers that already know your company can be convinced of the the high quality and your great customer service. If you attend trade shows or a small conference: You company can achieve a great benefit from gifts for customers and new customers. If you order larger quantities with allbranded, the products will be sufficient for several conferences, exhibitions or seminars. Your customers will be delighted about practical promotional products in the colours of your company.